The star of your next big production? 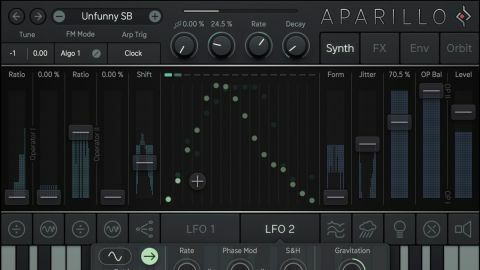 A sound designer’s dream synth, Aparillo presents a unique technical proposition and sounds absolutely incredible. Not easy to get into. Only one mod source per parameter. As previous offerings Cyclop, Obscurium and Factory make apparent, when Sugar Bytes sets its sights on building a softsynth, the end product is invariably like nothing we’ve ever seen before. The latest, Aparillo (VST/AU/AAX/ standalone), is billed as primarily intended for “cinematic sound design”, and one look at its unearthly interface makes it clear that this is yet another curveball from the German developers. Aparillo is a 16-voice, two-operator FM synth, with the operator parameters accessed in the Synth page of the tabbed GUI. The Ratio and FM sliders control the harmonics and modulation intensity, while a choice of three algorithms enable each operator to run in parallel; Op I to modulate Op II with the Op II Ratio applied to Op I; and the same again but with the sum of both Ratios applied to Op I’s modulator. Three harmonic modes determine the ‘snapping’ of the Ratio: Off (full spectrum, for inharmonic sounds), Quantized (the Farey Sequence) and Harmonic (40 specifically-selected harmonic ratios). The Op Balance slider mixes between the outputs of the two operators. While Aparillo’s 16 voices can be used for regular polyphony, they’re really meant to be stacked for wild ensemble patches using the synth’s unique voice modulation setup, which we’ll come back to shortly. Indeed, so central is Unison mode to the whole Aparillo concept, it’s the default state rather than a secondary option. Detuning of the 16 Unison voices is done with the Shift slider and the pop-out Scale Editor, where you load various preset transposition scales or design your own, spreading the 16 voices out over up to three octaves. Voices can be dragged smoothly between chromatic pitches for disharmonic unison, or snapped to them for chords. The Orbit page is a sort of XY macro controller on steroids, for the design of elaborate synth-wide modulations. Fifteen of Aparillo’s parameters are laid out as ‘objects’ in the Orbit ‘cosmos’, including Operator Balance, Reverb Mix, Formant, Brightness, Arp Mix, Jitter and Filter Cutoff. Moving the red Orbiter puck towards one within its ‘radius’ (the dotted circumference) increasingly applies its effect, so by moving the objects around, specific areas of multi-parameter modulation can be defined within the Orbit. You can record Orbiter movements for triggered playback (looped or not), and up to 128 positions can be assigned to MIDI notes for keyboard-controlled operation. The X and Y axes are also MIDI CC assignable, of course. Right-clicking an object reveals controls for adjusting its modulation Amount, Radius, Level and Pan, and all Amounts and Radii are randomisable at a click, as are the Mouse and Key recorder buffers, and object positions. Dragging in the cosmos background, meanwhile, moves all objects at once, bouncing each on back inwards when it reaches any edge. The Orbit is pure Sugar Bytes: brilliantly innovative, deeply powerful and - more than anything - endless fun to play around with. The Form parameter applies either or both of two waveshaping effects (Formant and Shaper, the last narrowing or broadening the waveform) to one or both operators, followed by optional wavefolding. Think of it as a highly manipulable ‘distortion-plus’, and you won’t go far wrong. The Jitter slider controls the depth of a randomising algorithm that knocks the phase of each wave cycle around a bit, resulting in what Sugar Bytes very accurately describe as “a rather granular noise”. To the right of the Synth page, Brightness controls the FM feedback circuit, pulling Aparillo’s sine waves into saws at the top of its range. In loose terms, it makes the synth sound more ‘traditionally analogue’. The bank of signal processing modules in the FX page comprises a multimode resonant Filter, the Spacializer delay/comb filter, an auto Panner, a feedback Delay, and a very passable reverb. More than anything, Aparillo is about modulation, most notably that generated by its two polyphonic LFOs. These are visualised in the central panel of the Synth and Env pages as a row of 16 dots - one for each voice. At default settings, they all move together - in a sine wave, or linear up/down, looped or one-shot - at the set Rate and Phase. Tweaking the Jitter knobs for those parameters offsets the speed and start position of each voice, for unison modulation, visualised by the movement of the dots in the LFO display, and the meter array behind the slider of any targeted parameter. From 0-50%, the offset is increasingly random; from 51-100%, it transitions from random towards a progressive, even spread from voice 1 to voice 16. Further to that, LFO 1 can modulate LFO 2’s phase, and both LFOs can be set to stepped output via their respective Quantize and S&H parameters. The Gravity knob is a novel addition, too, messing with kinetics of the LFOs over time, ‘bouncing ball’ style; and the option to have each voice retrigger only when it collides with the same voice in the other LFO is genius. The LFOs are truly spectacular, seamlessly merging unison voice pitching (through modulation of Shift) and conventional parameter modulation. They aren’t the only modulation sources, though. There are also two ADSR envelopes, a range of fixed curves, MIDI velocity, and pitch and mod wheels. As for targets, almost every slider in Aparillo accepts (a single) modulation input - Shift, Jitter, Op Balance, the Filter and Spacializer, all envelope stages... and the aforementioned meters give instant feedback on their per-voice activity. Closely related to the LFOs, the Arpeggiator picks out certain voices from the 16 available for arpeggiated ‘plucking’, depending on which of the four modes it’s set to. Clock mode is your standard rate-controlled arp, while Threshold (LFO 1 or 2) and Collision modes see the Arpeggiator triggering only when the LFO for each voice crosses a user-defined threshold in the LFO display, or the two LFOs for a given voice meet. The Arp output is a separate audio stream with its own operator balance control, mixable back in with the main output, and also available as a modulation source. With its highly individual architecture and workflow, Aparillo isn’t the easiest synth to get into, but perseverance brings great rewards. The sounds it makes run from epic pads, drones and soundscapes to monolithic basses, delicate keys and alien percussion, and its pervasive ‘modulated ensemble’ ethos gives it a cinematic character all its own. Messing around with those amazing LFOs never gets old, and the Orbit controller serves as an intuitive performance layer for effective manipulation of the whole instrument via mouse or MIDI. Just like Sugar Bytes’ other synths, Aparillo is an inspired concept, beautifully realised.